Our bodies go through a tremendous amount of change when we are pregnant. It is important to remember that every woman’s body is different and our bodies will not all react the same to pregnancy. What ever your shape or size, embrace the pregnancy, eat well and keep active. Some factors that might determine our pregnancy and how our body adapts are: genetics, body type, exercise, the food we eat and our pre pregnancy weight. Most women will experience an increase of up to 3 cups sizes throughout their pregnancy. The majority of the growth will be experienced in the first trimester. TIP: Avoid restrictive cupped sized maternity bras early on. Opt for a supportive seamless maternity bra that will stretch and change with your growing bust during those transitional periods. Widening of the rib cage allows your body to accommodate for the growing baby. This process will be slow and gradual and will contract again once baby is born. TIP: When purchasing a bra early on in your pregnancy, make sure the bra fits to the tightest hook. A good maternity bra will have 6 hooks and eyes, which gives your plenty of room for expansion as your ribcage continues to expand. As your body grows your skin will begin to stretch. The skin over your growing belly and breasts are likely to become tight. It is likely to be irritated by things that caused you no discomfort pre pregnancy. TIP: Avoid abrasive fabrics, synthetics and or exposed seams, as they are likely to irritate. Keep well moisturized and drink plenty of water to help keep your skin well hydrated and supple. Wear natural fibers such as cotton and bamboo and avoid restrictive clothing. 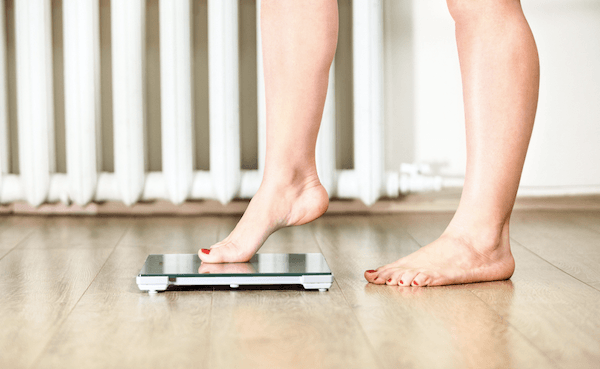 Every woman will experience some weight gain throughout her pregnancy, just how much weight you put on will be will be determined by your body type and your lifestyle choices. The reason why we put on weight is not only because we have a growing baby inside of us, but also our breasts have increased in size, we have extra blood and fluid in our bodies and a placenta. 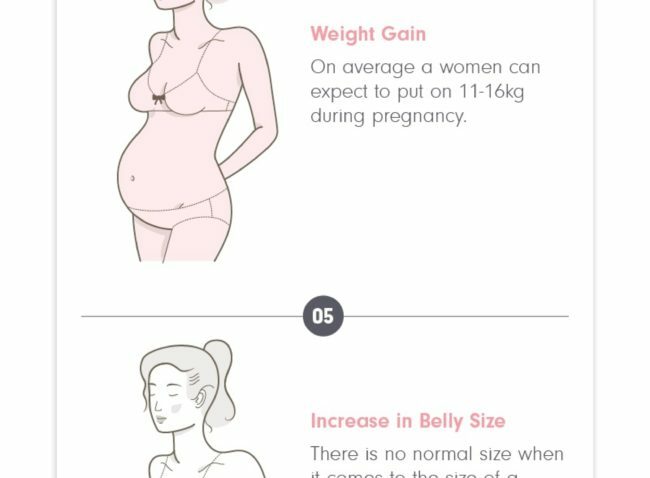 On average a women can expect to put on 11-16kg during pregnancy. TIP: Maintain a healthy active lifestyle whilst pregnancy. Get plenty of exercise and eat a well balanced diet to avoid excess weight gain. There is no normal size when it comes to the size of a pregnant belly. Every woman will carry differently. Some women will carry very small while others will carry a much larger bump. The size of your bump does not necessarily determine the size of your baby. TIP: Make sure you attend regular appointments with your health care provider. They will measure and monitor the growth of your unborn child. Throughout your pregnancy you may notice an increase in the amount of fat found around the outside of your hips and buttocks area. You may also notice a widening of the hips in the third trimester. This is nature’s way of preparing the birth canal for labor. A pregnant woman’s body will increase from around 37degress to 37.8degress whilst pregnant. This is due to an increase in blood flow. TIP: Avoid saunas, hot baths, the hot midday sun and poorly ventilated areas. Hot environments are unhealthy for you and may cause you to feel dizzy or nausea. With hormones racing in your body some women will experience breakouts and or other skin conditions. The good news is that these conditions are often short lived and that after the birth of your baby your skin will slowly return back to its normal state. A lot of women will suffer from skin pigmentation due to high hormone levels in the body. These are noticeable areas of dark or light patches of the skin. The good news is that these will slowly fade away after birth. Swollen ankles are very common during pregnancy; the extra fluid in the body and the weight of your growing baby can cause them. Back pain can be debilitating! The continued pressure on your lower spine as your belly continues to grow in weight and size causes it to ache. Belly support bands can be purchased to help aid in supporting your back to help relieve the pain. Some women will experience a shortening of breath in the later stages of pregnancy. This is due to the baby-sitting high up under the rib cage. Once baby drops you will experience welcome relief. The continued pressure on your bladder will cause you to use the toilet often. Vomiting and the generally feeling of being unwell are common for a lot of women in the early stages of pregnancy. It is commonly known as morning sickness. The good news is that it will pass, usually after the first trimester. Feeling tired is normal. The energy your body is expending on growing your baby is enormous. It is important to take it easy and rest when necessary. Your belly button will pop usually in the third trimester due to the expanding uterus putting pressure on the rest of the abdomen. After birth the pressure will be relieved and the belly button will return back to its normal state. This is a line that goes from your belly button downward. It is caused by fluctuating hormones and will disappear after birth too. What ever your experience, remember that pregnancy is short lived. Our bodies are remarkable things and they do bounce back in time. What were some of your most memorable pregnancy body changes? Did they last long and how did you cope with them?